We love the variety that you can have with a home aquarium. Each different fish that you add to your tank adds another element of unexpectedness and variety to the aquatic world that you are creating. Here is a look at some fish that we feel make a great addition to any home or office aquarium. 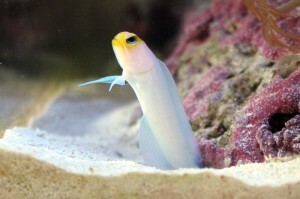 This saltwater fish digs out it’s home in sand and rock, clearing away the debris as it goes. After it builds it’s home, the pearly jawfish spends most of it’s time in and around it’s home, which might make it seem shy. The fish has been known to jump out of it’s tank it’s scared or frightened, so watch out! This tropical fish is native to Hawaii and the indo pacific. It is one of the more popular home aquarium fish of the surgeonfish, and it tends to be more aggressive towards fish of a similar form and colour. They need plenty of rock and space to swim and hide, and they are beautiful to watch in their tropical environment.